Elsevier clears more profit than Walmart, Apple, and Disney. 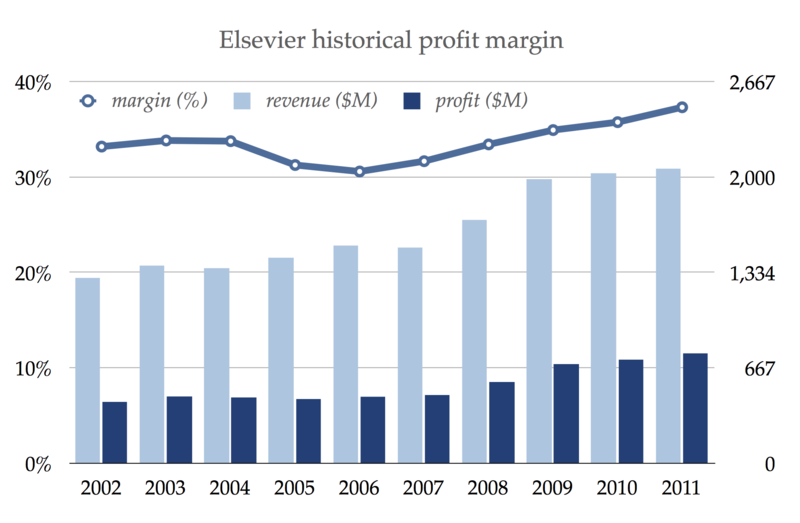 Data are from Mike Taylor, The obscene profits of commercial scholarly publishers, 2012. Chart by Stuart Shieber, 2013. Challenging U.S. copyright law and scholarly publication practices, activist Aaron Swartz drew a civil lawsuit for downloading a ton of JSTOR articles using a computer stashed inside a MIT’s library IP-space. (See Lawrence Lessig’s video about Swartz’s copyright activism). The required readings for the Graduate Center’s Spring 2013 JustPublics365 POOC are selected not only because they’re interesting and relevant, but also because they’re available in a free and open digital format. Lots of what we want to read is still locked up behind digital pay walls; we were only able to liberate some of it. For this course, many of the suggested readings are marked with an asterisk. This means that to reach them online, you have to be a Graduate Center affiliate (with an active GC network userid/pwd) or an affiliate with another subscribing institution. Academic authors and activists have to make it happen. Publish in a journal that is all (or “gold”) open access with DOAJ.org. Or use a SPARC sample contract to negotiate with your publisher to retain author copyright. Or, use the Sherpa/Romeo tool to find a journal’s standing permission for open access author archiving (“green” open access). About 95% of academic journals have standing permission for authors to post already-published articles on the web after a 6 – 24 month embargo. If every academic would post their articles following publisher guidelines already in place, there would be lots more reading available for our Spring 2013 POOC. This entry was posted in Copyright, Open Access, Repositories. Bookmark the permalink. Both comments and trackbacks are currently closed. “Publishing and the POOC, or, why we need open access”. I may you should be heading back to ur blog soon.